Nestled within the mighty Himalayas of Uttarakhand is the ultimate ski destination of India, Auli. Literally translated as ‘Meadows’, it is situated at an impressive height of 2,300 meters above sea level and is known to be a popular hill resort dating back to 8th century AD. 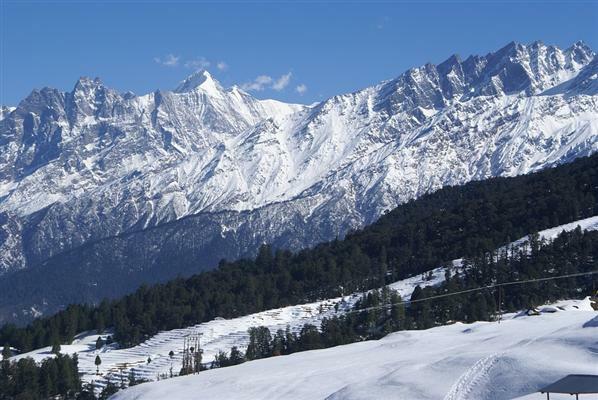 Swathed under a blanket of dazzling white snow all year round, Auli is a premier skiing destination that allures tourists locally and from all over the world. A charming town, it encompasses stunning views of the majestic Himalayas, verdant forests, alpine trees, apple orchards, and expansive snow-draped landscapes. What makes the town even more breathtakingly beautiful is the looming presence of the famous Himalayan peaks – Nanda Devi, Kamat Kamet and Mana Paravat. Dotted with several temples, Auli is surrounded by towns that hold religious significance in Hindu culture. Perched at a height of 3,056 meters above sea level, Gurson Bugyal is a riveting meadow of luxuriant green landscape offering awe-inspiring views of the imposing Himalayan ranges. You can reach here by trekking for 3km from Auli or taking the ropeway from Joshimath. Winter trekking is extremely popular here wherein you can trek from Rishikesh to Joshimath, passing through the valleys between the mountains – Nanda Devi, Dron and Trishul. During spring, it transforms into a green canvas bedecked with gorgeous pine, oak and conifer trees. A spectacular sight to behold is the Trishul Peak in the Kumaon region of Uttarakhand. At a height of 7,120 meters, it is named after the trident of Lord Shiva and is a group of 3 mountains that offer a fascinating view from three dimensions. The peak, draped with pure glistening white snow, provides a gorgeous challenging trail for ski experts. You can also soak in the magnificent views from high above by indulging in a cable car ride to the peak. 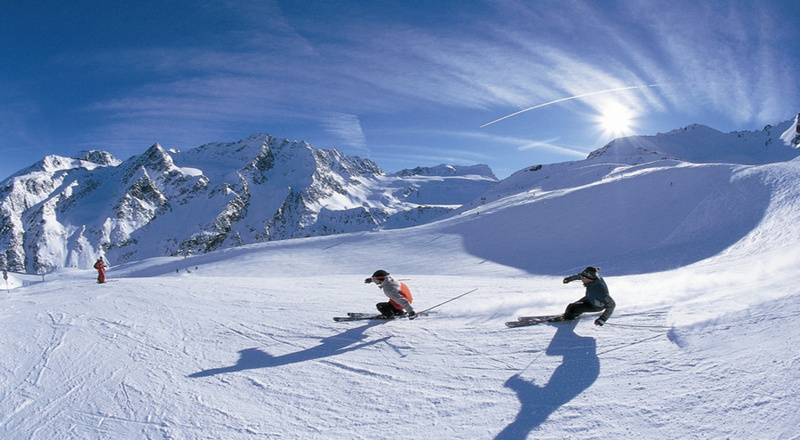 There are also training camps here that offer skiing courses. A picturesque vista, the Auli Artificial Lake is the highest man-made lake specially created by the government to power the snow guns positioned along the ski slopes to create artificial snow and perpetual artificial ski slopes during summers and low snowfall scenarios. The mesmerising frozen lake set against the background of Nanda Devi peak is a must visit. A splendid vision, Chenab lake situated near Dang village is a serene and enchanting crystal clear lake reflecting the surrounding lush greenery. Explore the quaint villages and the stunning scenic beauty of this offbeat area that also serves as a base for trekking and camping. The town with deep religious significance, Joshimath is held in high reverence and is a prominent pilgrim place amongst Hindus. Founded by Sri Adi Shankaracharya as one of the 4 centres for sanyasis in the 8th century, this quaint village has a charming spiritual vibe that envelopes the visitors. There are several temples here, Narsimha temple being the most popular one and it is also the base for treks and expeditions towards the Himalayas. Joshimath also serves as the gateway to the resplendent Valley of Flowers. Regarded as one of the Panch Prayags, Rudraprayag is the convergence point of rivers Alaknanda and Mandakini. A charming town, it is considered a sacred holy place hosting several temples such as Chamunda Devi Devi Temple, Rudranath Temple and many others. Rudraprayag boasts of spectacular pristine nature in all its splendour and glory. Visiting Rudraprayag will invigorate your soul and elevate you spiritually. A confluence point of rivers Alaknanda and Nandakini, Nandaprayag is a surreal destination that attracts trekkers from across the globe. Being the second of the panch prayags, it holds a religious significance as well. A hub of spirituality and adventure, Nandaprayag is a fascinatingly beautiful town which also serves as a gateway to pilgrim yatras to Badrinath and Kedarnath. Fast emerging as a favourite spot for honeymooners, Chattrakund is a small and serene crystalline lake positioned at 3,300 meters above sea level. Encircled by dense verdant forests comprising of majestic Pine and Oak trees, the picturesque view creates a mystically beautiful ambience oozing romance that attracts couples to spend some quality time here. Kuari Pass is an exciting trek trail in the Chamoli district of the Gharwal Himalayas. Situated at an elevation of 12,200 feet it is a fairly easy trek surrounded by the scenic beauty of the lofty mountains, tranquil rivers and green vegetation. The trek begins from the base of Joshimath. Soak in the magnificent views of Nanda Devi mountain, tributaries of river Ganges and verdant forests as you ascend the trail. One of the five prayags and a confluence of rivers Alaknanda and Dahuliganga, Vishnuprayag is a holy town famous for the Vishnu temple and the incredible views of the mighty Himalayan ranges and lush greenery. Famous as a skiing destination, Auli offers a brilliant landscape of the snow adorned Himalayan ranges with thrilling trails and finest slopes alluring every skier, trekker and adventure enthusiasts. Some of the famous routes are Nanda Devi, Kamat Kamet, Mana Paravat, Kuari Pass and tapovan. Apart from the scenic attractions that boasts of exhilarating skiing trails and spirituality, Auli also is an exciting destination for camping. Indulge in a night of camping for a memorable experience of fun, excitement, amazing food, fresh air, tranquillity and resplendent views featuring a starlit sky in the night and radiant sunrise in the morning. One of the must-do activities in Auli is the fascinating cable car ride that starts from Joshimath and ends in Auli. A riveting experience, the ride offers a spectacular view of the captivating valleys, majestic Himalayas, verdant carpeted meadows, winding blue rivers and the clouds hovering above.